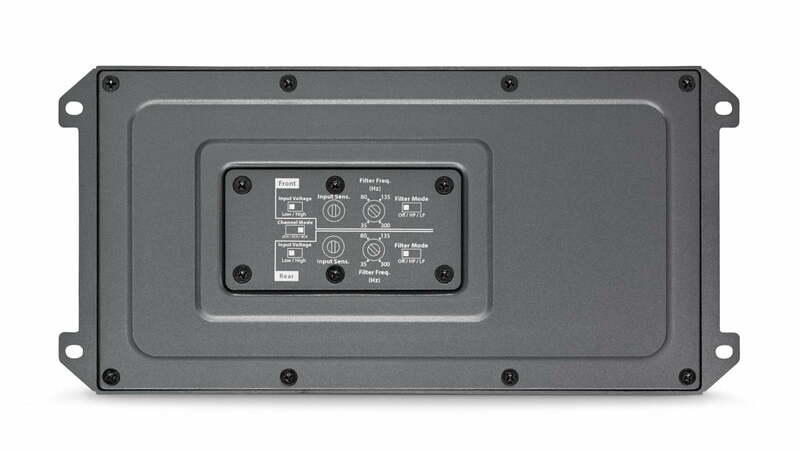 Engineered specifically for powersports applications, the 4-channel JL Audio MX500-4 amplifier employs JL’s high-speed NexD™ switching design to deliver plenty of clean power, without straining charging systems. Its tiny, cast aluminum chassis is highly resistant to corrosion, with an IPX6 water-resistance rating, making it perfect for motorcycles, ATV’s or other utility vehicles. Generating a solid 70W x 4 into 4 ohms (14.4V, 1% THD), the JL Audio MX500-4 is fully bridgeable, so it can be used as a 3-channel amplifier, or as a 2-channel amplifier producing a potent 250W x 2 into 4 ohms. Other features include independent front and rear crossovers with selectable full-range, high-pass or low-pass filter controls and a dual-range input section that accepts a wide range of input voltage levels, from line-level all the way to high-power speaker level signals. This amplifier features a black powder-coated finish, a gasketed cover for the controls and stainless steel hardware for durability. NexD amplifier technologies produce exceptional audio quality, unsurpassed total efficiency and high power from very compact amplifier designs. For the full-range NexD™ amplifiers and channels JL Audio applied a variable, ultra-high speed version of the NexD™ technology (switching at well over 400 kHz). In these designs, a self-oscillating modulator with “feed-forward” sends information about the instantaneous power supply voltage to the modulator, combining this with the input signal to cancel out any distortion due to supply voltage fluctuation. This reduces distortion prior to applying feedback, simplifying the overall feedback loop design. The bottom line is simply great audio: clean, powerful and reliable.